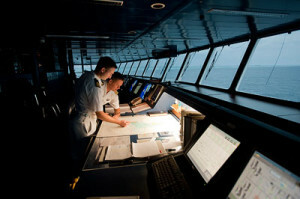 Deck Officers (aka: Navigation Officers) maintain watches on the bridge while the ship is at sea and in port. Some of their responsibilities include passage planning, safe navigation of the ship, crew safety training, ship stability, and maintenance of deck and safety equipment. The career path of a Deck Officer starts as a Deck Cadet. Through continuous education and sea time a Deck Officer may rise through the ranks from Cadet to Third Officer to Second Officer and then to First Officer. Many cruise lines split the duties of a First Officer into two positions, Navigator and Safety Officer with the First Officer in charge of safety as the more senior of the two. The pinnacle of a Deck Officer’s career is to eventually be promoted to Staff Captain and then to Captain. When applying for a cruise ship job as a Deck Officer, depending on the rank will dictate how much training and experience is required. Deck Officer’s licenses and certificates must be in compliance with all international conventions and regulations as required by STCW95. Here are a list of the major cruise lines and details on how to apply as a Deck Officer. Carnival Cruise Lines – Carnival Cruise Lines recruits most of their officers through their approved network of employment agencies, also known as manning agencies. These agencies help locate, screen and interview potential crew members on Carnival’s behalf. Celebrity Cruises – Celebrity Cruises lists their current “Job Openings” on their employment website and qualified candidates are encouraged to apply online. If you don’t see a job posting for a position that matches your qualifications, check with your nearest hiring partner. Celebrity has a network of hiring partners to assist in meeting recruitment goals around the world. Crystal Cruises – For shipboard contracts as a Deck Officer with Crystal Cruises, visit the International Cruise Management Agency (ICMA) website and apply online. ICMA is an authorized recruitment partner for Crystal Cruises. They are the only partner that is authorized to process applications for Deck Officers. Cunard Line – Visit the Carnival UK Careers website for more information about applying for a cruise ship job as a Deck Officer with Cunard Line. Applicants may view current vacancies and apply online as well as register their personal details with the Carnival UK database for job alerts. They also offer a cadet program for eligible UK residents. Disney Cruise Line – To apply for a cruise ship job with Disney Cruise Line as a Marine and Technical Operations Deck Officer, visit the Disney Parks and Resorts careers website where candidates may apply online. Holland America Line – Candidates desiring employment as a Nautical Officer in the Deck Department on board Holland America Line should visit their employment pages for more information. Viking Recruitment also manages over 300 of Holland America’s officers. Norwegian Cruise Line – To apply to Norwegian Cruise Line as a Deck Officer, visit Norwegian’s employment pages. Norwegian’s website features current shipboard positions available. Applicants may attach their resume in an email along with a cover letter to be considered for a personal or webcam interview. Additionally, Norwegian Cruise Line has recruiting agents throughout the world. If you are from one of the countries that they list on their website, submit your resume to the hiring partner. Oceania Cruises – To apply for a cruise ship job as a Deck Officer with Oceania Cruises, visit the employment pages of their website. At the bottom right hand side of their website, click on the ‘Ship Position’ tab for a list of current job openings. Next click on the job title you want to apply for. Applicants may apply through Oceania’s online application form. P&O Cruises – Visit the Carnival UK Careers website for more information about applying for a cruise ship job as a Deck Officer with P&O Cruises. Applicants may view current vacancies and apply online as well as register their personal details with the Carnival UK database for job alerts. They also offer a cadet program for eligible UK residents. Princess Cruises – Princess Cruises cooperates with a world-wide network of Recruiting Agencies. Contact the recruitment agency that is closest to your permanent residence. Candidates located in the United Kingdom and interested in employment in the Deck and Technical departments may submit resumes directly to the Princess Cruises Recruitment department in Southampton. Princess Cruises also offers cadetships to eligible candidates. Regent Seven Seas Cruises – To apply, visit the Regent Seven Seas Cruises employment pages of their website. Select the option “Ship” for a list of job vacancies. Applicants may apply online for their selected choice. Royal Caribbean – Royal Caribbean International lists their current “Job Openings” on their employment website and qualified candidates are encouraged to apply online. If you don’t see a job posting for a position that matches your qualifications, check with your nearest hiring partner. Royal Caribbean has a network of hiring partners to assist in meeting recruitment goals around the world.